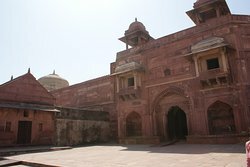 Extra Agra Fort is a historical fort in the city of Agra in India. It was the main residence of the emperors of the Mughal Dynasty till 1638, when the capital was shifted from Agra to Delhi. Facts Akbar’s mausoleum was built in the beginning of 17th century by his son, Jahangir. Extra It was built in 1635.